Our speedy tour through southern Utah proved worthwhile as we arrived on time in Prescott at noon on Friday. 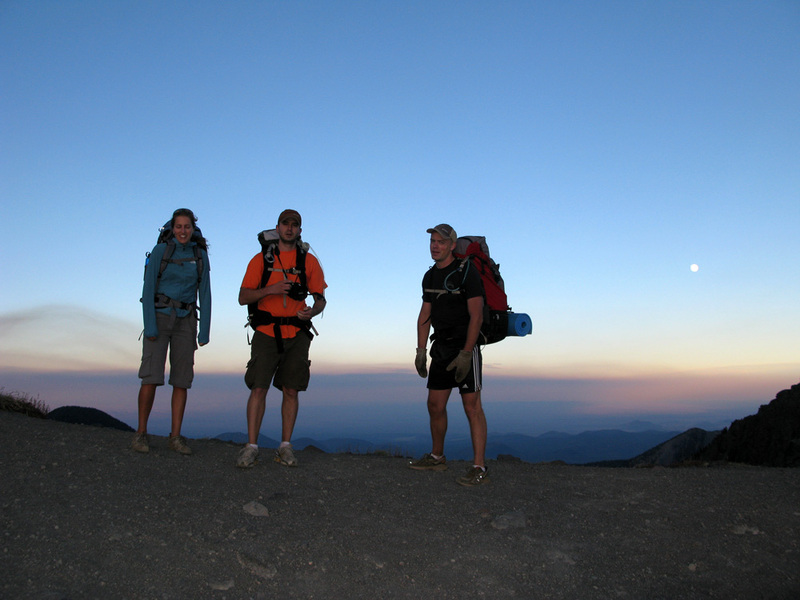 We met up with the VonFange brothers: Jesse and Steve, and quickly got organized to head off into the mountains once again. Pat’s friend from home Jesse flew out to meet us in Prescott, where his brother Steve works as a flight instructor at the Embry-Riddle Aeronautical University. The four of us made a great team. After dumping all of our gear in Steve’s apartment we cleared away the “back seat” of the Jeep so the 4 of us could all fit. We don’t actually have a back seat anymore (the vertical back cushion flips up, but the bottom seat cushion was removed pre-trip to fit the bikes), so we improvised with thermarests, tents, etc. to create a little padding underneath. No matter, it got us to our destinations safely as the seatbelts still worked. 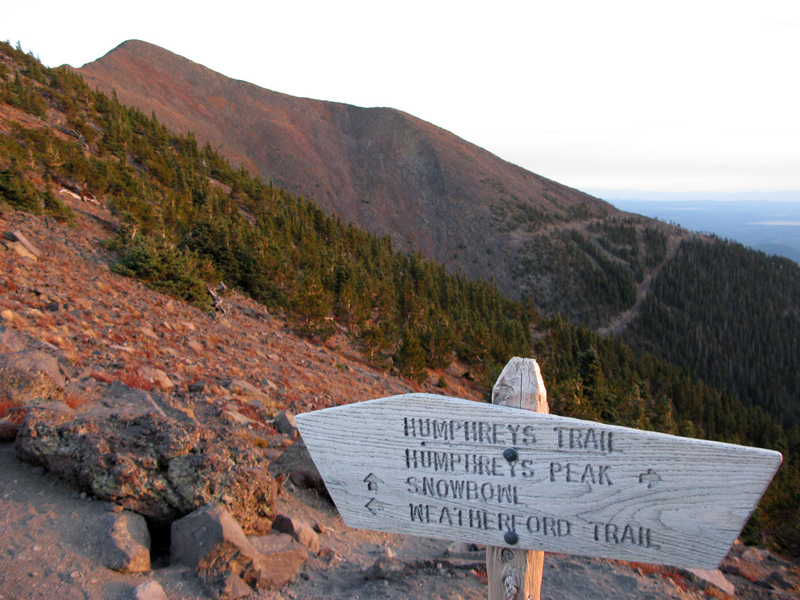 Our first stop being the Arizona Snowbowl in Flagstaff to climb the highest peak in Arizona, Mount Humphreys. 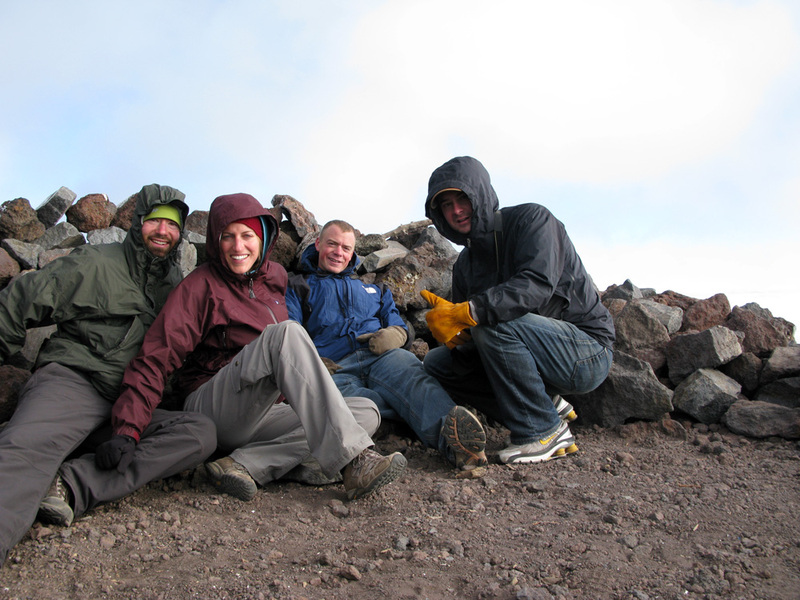 The extinct volcano is 12,637 feet and soars well above everything else in the state. Our alpine start was actually late afternoon, since we intended to sleep on the mountain that night. Steve assured us that this could be done, since there is a rock shelter up top that protects us from the elements. So we started our trek around 4 PM. Needless to say we had most of the mountain to ourselves, except for a few hikers coming down. We climbed about 3,000 vertical feet and 3.5 miles up to the saddle, where we discovered a colorful sunset and strong winds. A cold front had hit northern Arizona the day before, so we were expecting low 20s and perhaps high teens at night. We still had another 1,000 feet of tundra to climb to the top, so we thought it best to stay where we were and set up camp for the night. That was not hard to do. We laid down our thermarests and sleeping bags, and put on every piece of clothing we brought. For dinner, Jesse and Steve had bought some gourmet salami, cheese and crackers, and we passed around a bottle of port wine as a night cap. 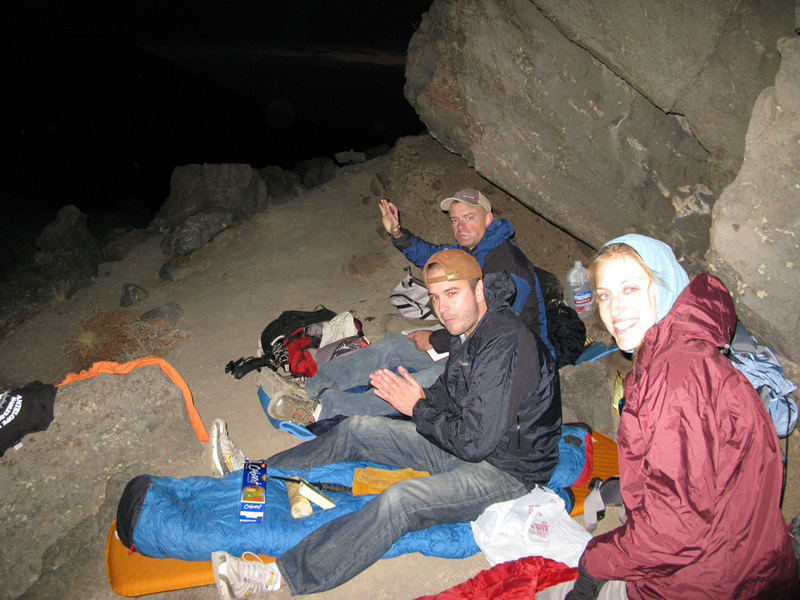 There was little else to do but crawl into our sleeping bags, hope for slumber, and wait for the sun to rise. On the saddle of Humphreys just before sunset. We conquered the saddle. 1,000 feet left to climb tomorrow morning. Our camp for the night. No tent, just sleeping bags, snacks and port wine. 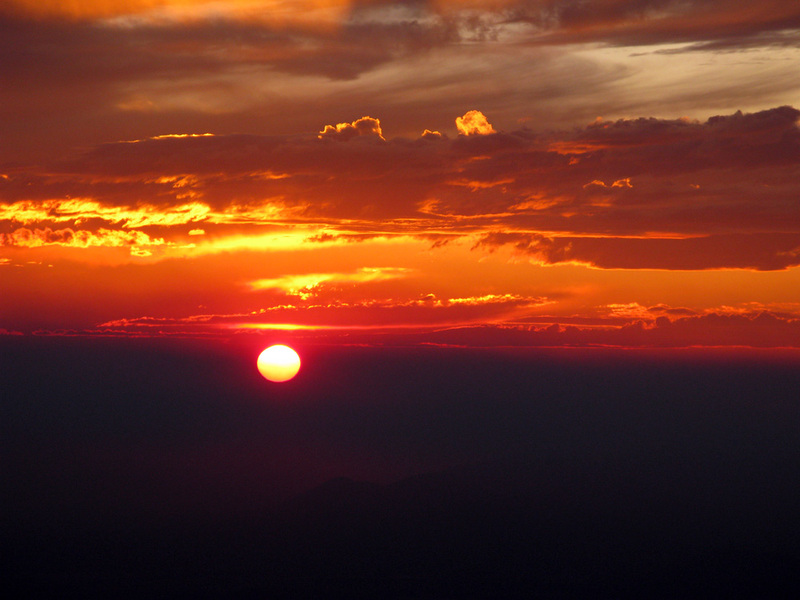 The sun rose, though a bit reluctantly, which surprisingly made for the most mysterious and captivating view. The winds were still going strong and created a swirl of clouds circling above the bowl. 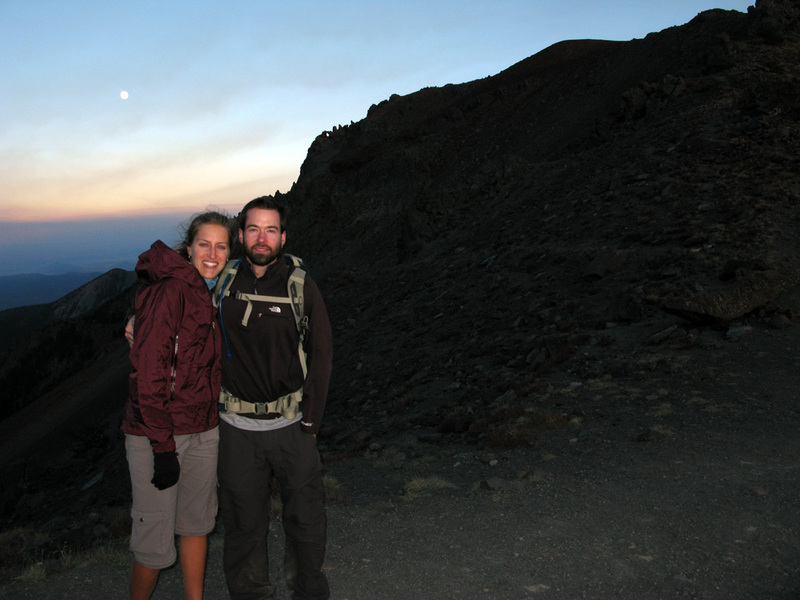 We were happy to have stayed the night there, since the peak of the Humphreys would have been covered with clouds and impossible to see the sunrise. 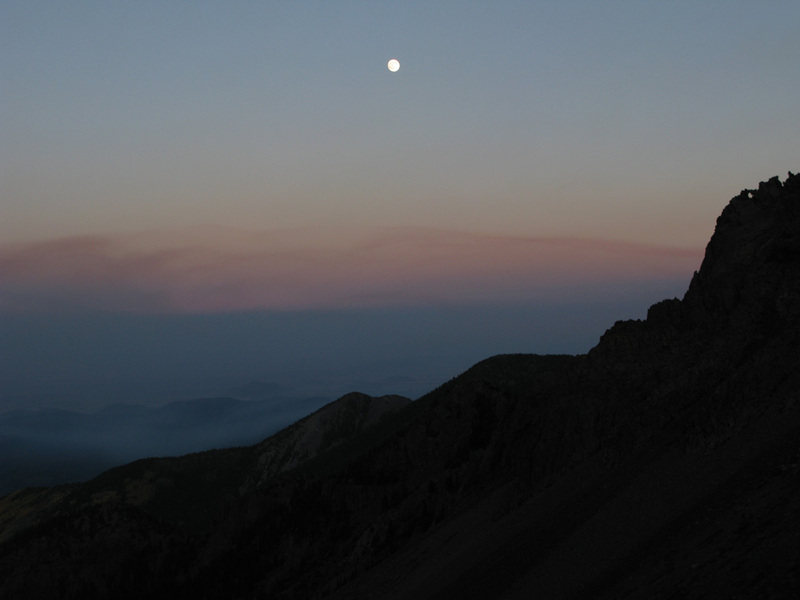 In the middle of the night, we heard a few hikers make their way up around 4 AM. 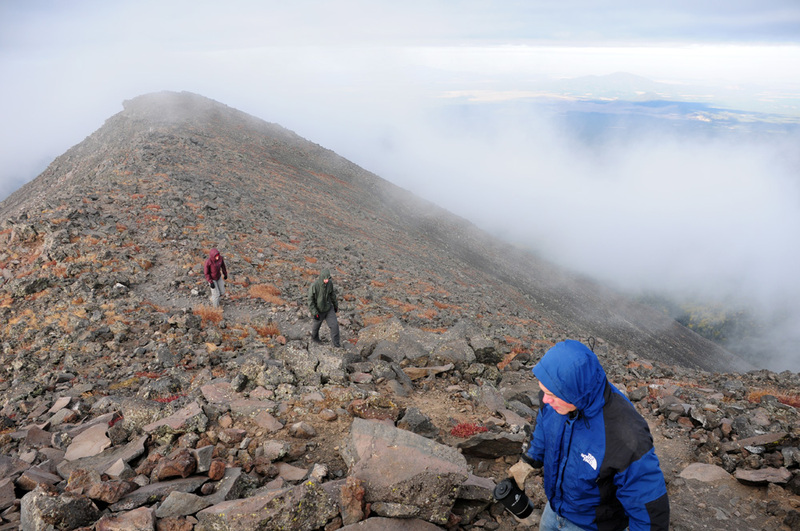 They must have waited it out, quite miserably, before the disappointment of no visible sunrise from the summit. We thanked our good luck and decided to make a final run for the summit when the sun finally shone through enough to warm us up. The final leg of the climb was quite treacherous, with 40 MPH winds threatening to sweep you off your feet as you scrambled over rocks. We finally made it, rejoiced with a snickers bar (our breakfast), took a few pics and headed back down. We were glad to continue down the forest seeking shelter from the wind. We felt quite elated as we passed probably 30 people on our way down, all of them just starting their journey and envious that we were ending ours already (around 9 AM). 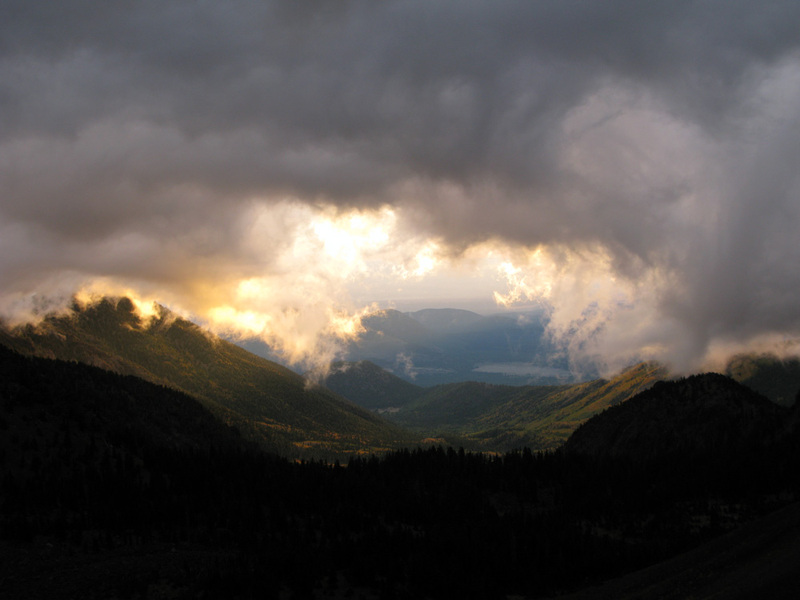 Morning sun peaking through turbulent clouds. Hanging on for dear life. Crazy winds! 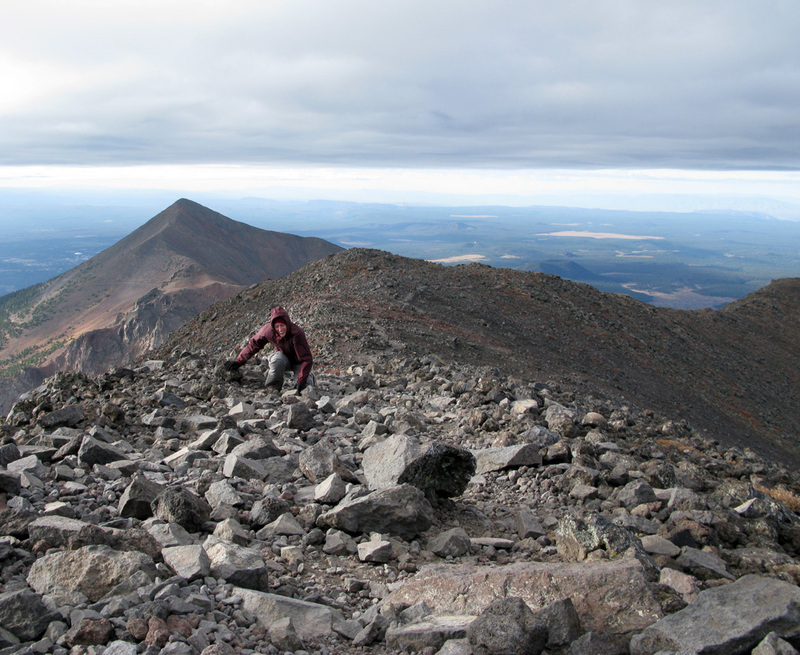 Almost to the top (photo by Jesse). Huddled on top of Humphreys. We treated ourselves to burgers for lunch in downtown Flagstaff, hopped back in the car and looked forward to a warmer adventure that afternoon. 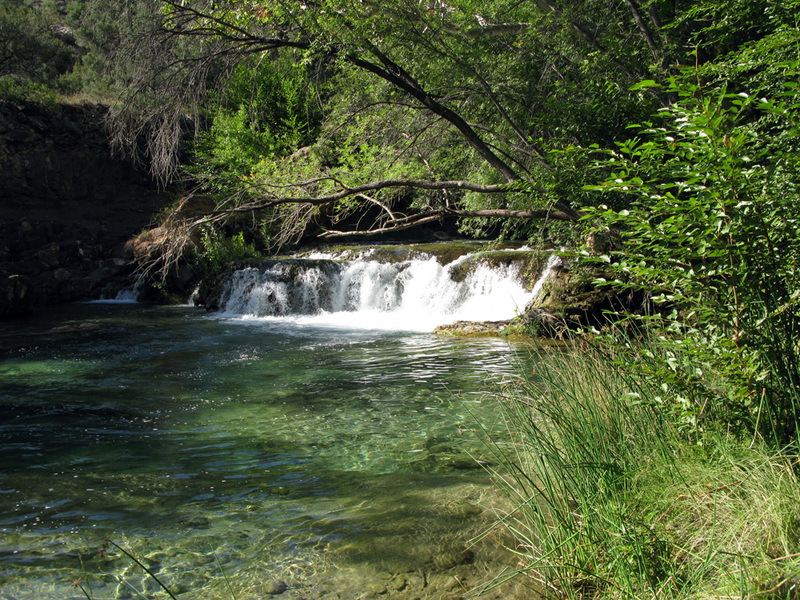 By the time we arrived at Fossil Creek (south east of Prescott), we had descended to about 2,000 feet, enough to entice us to dawn bathing suits and take a dip in the crystal clear waters. 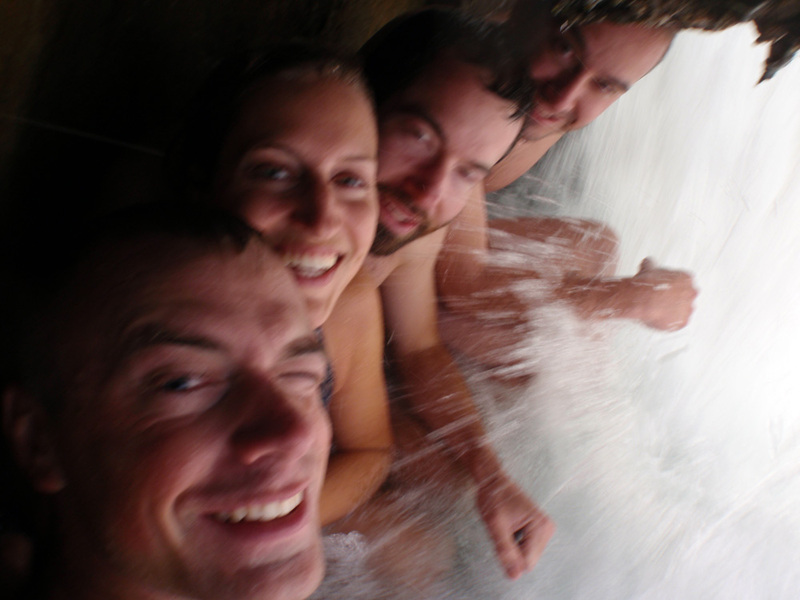 With Steve’s waterproof camera, we ventured behind a small waterfall and then plunged through the roaring whitewater to swim back to reality. Teams of small fish kept us company. It was such a drastic change in environment from earlier that morning, we felt as if we had crossed the border. Clear blue water at Fossil Creek. Under a waterfall at Fossil Creek. Photo by Steve. 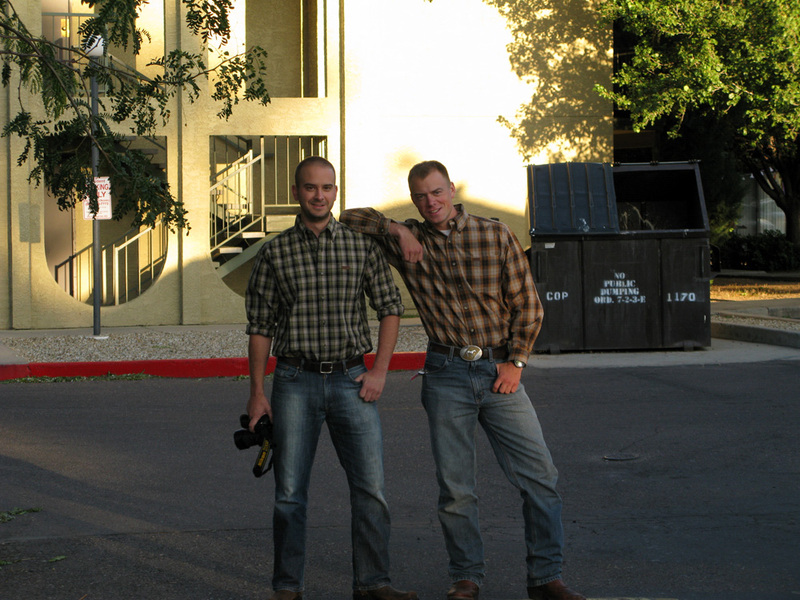 We headed back to Prescott that evening and made our way downtown to Whiskey row, where we celebrated our ascent with four Gentlemen Jacks on the rocks. 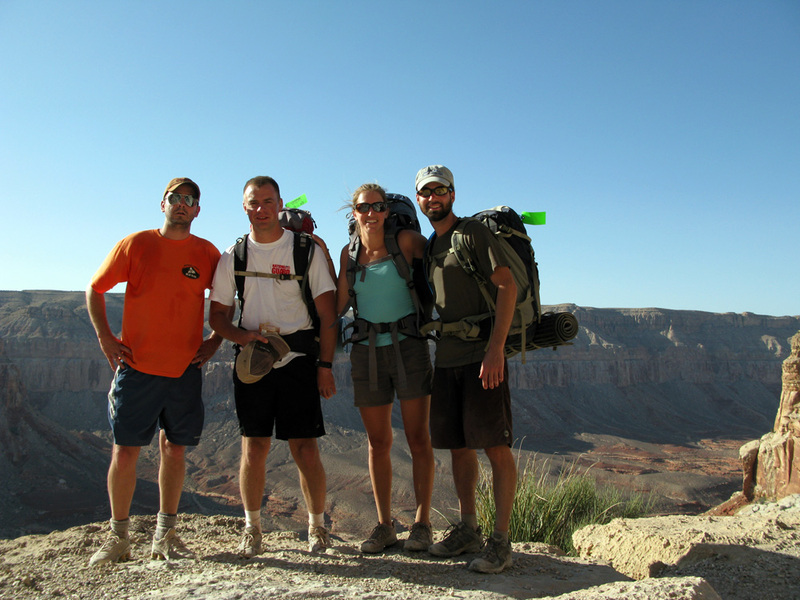 We ate a big dinner at a local brew pub to fuel the next day’s big feat: hiking down the Havasu Canyon. After a 3-hour drive north towards the Grand Canyon, we entered the Supai Indian Reservation and drove all the way to the rim of the Havasu Canyon. From there, we put on our packs and descended following the many switchbacks, passing hordes of hikers coming back up, and being passed by mules carrying supplies down. 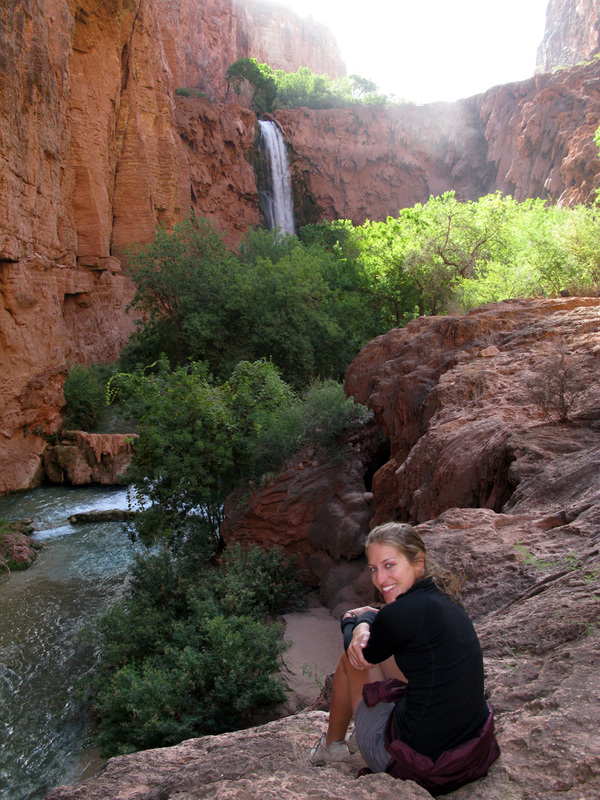 We continued 8 miles on rock and sand through red canyons, piercing green cottonwoods and past the poor Supai village until we reached the oasis: a series of waterfalls so grand and clear, Pat and I wondered why we had never heard of them before. It was spectacular! 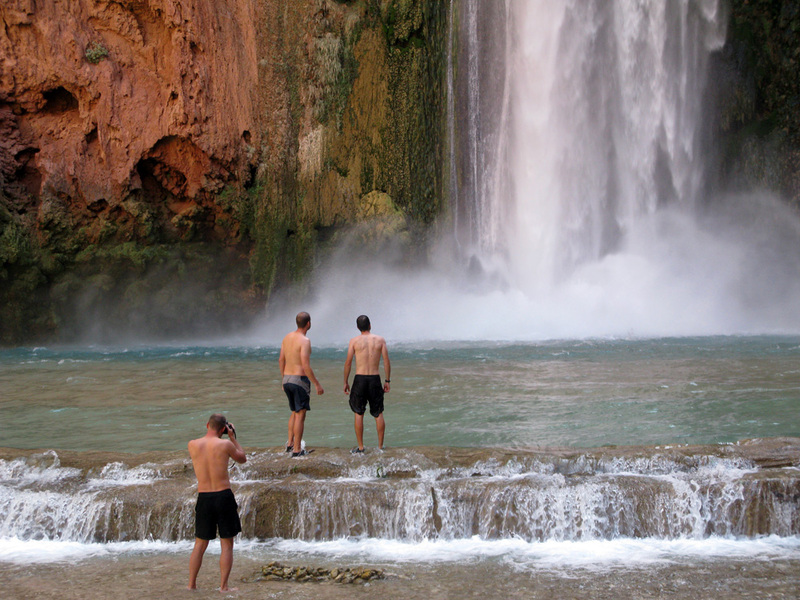 We couldn’t resist and went swimming right away at the base of the Havasu falls, although it was late afternoon and the sun wasn’t shinning on the falls anymore to warm our shivering bodies. We got as close to the falls as we could bear, until the stinging water pounded us back. Havasu canyon - beautiful but windy. A Cottonwood tree glowing in the sun. 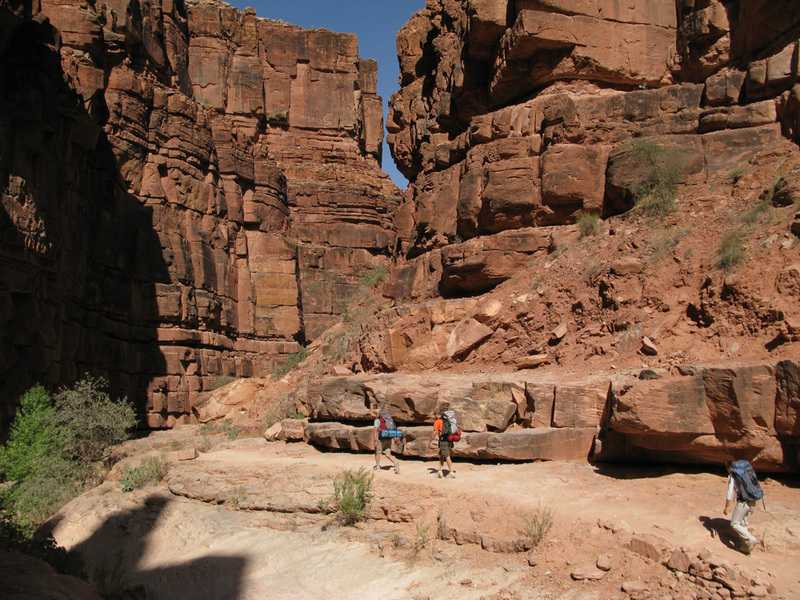 The trail snaked down deeper into the red rock canyon. Navajo falls - the first of three. 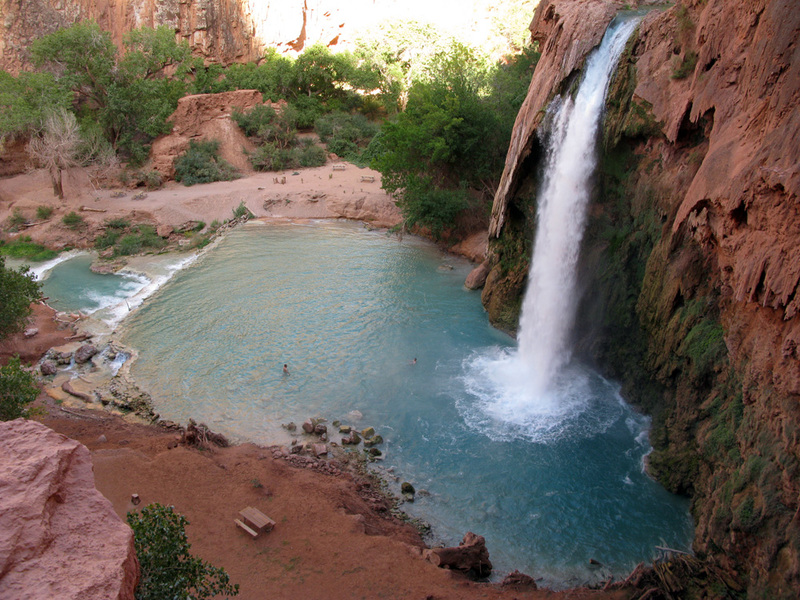 Havasu falls and swimming hole took our breath away. 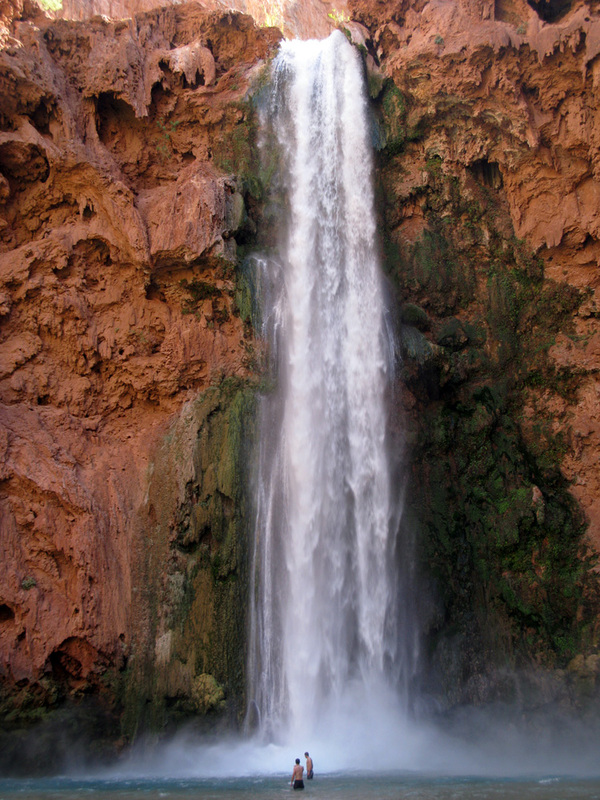 We hiked past the campground and peered over the edge of Mooney falls – the grandest of all at 200 feet. Spellbound, we followed Steve down the trail to get to the base of the falls. 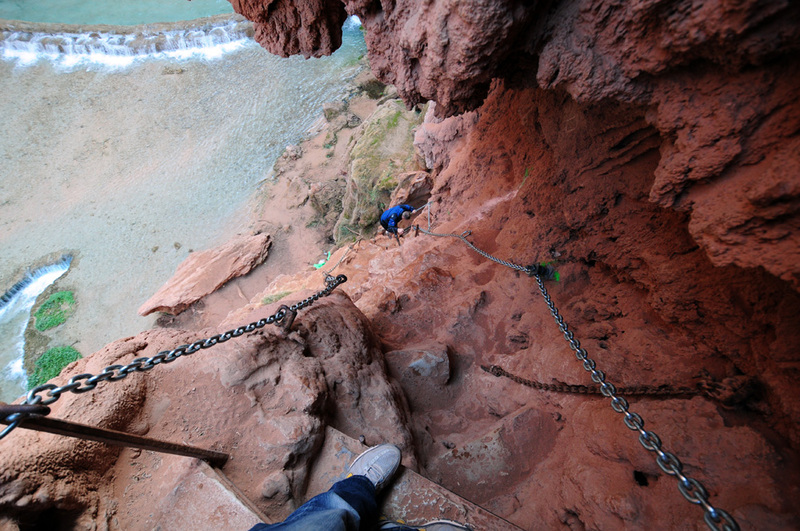 Little did we know (and Steve had not enlightened us on purpose), we had embarked on a series of foot holds carved out of the canyon with only chains and bolts to prevent our fall. The mist gathering at the base made it a tad slick as well on the final ladder decent. I managed to get down well enough, though with shaky hands. The reward was irrefutable. 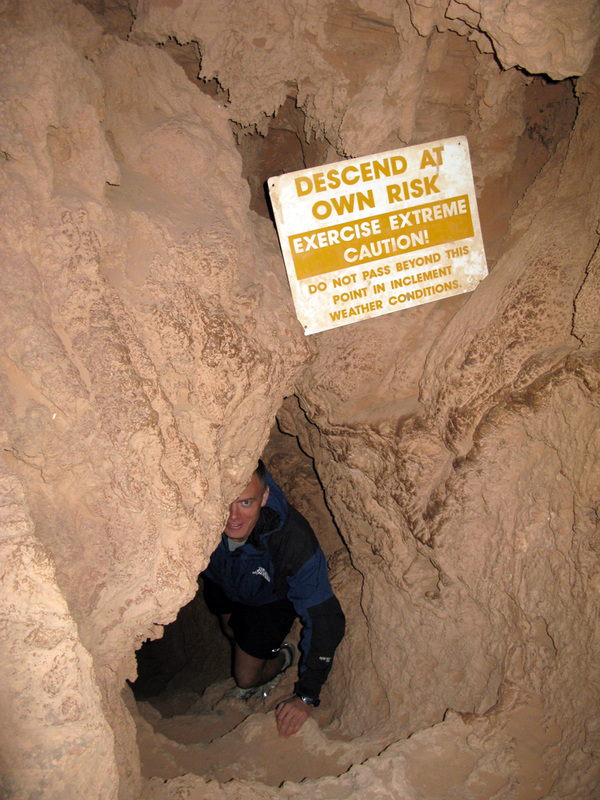 Down the treacherous descent to Mooney Falls. 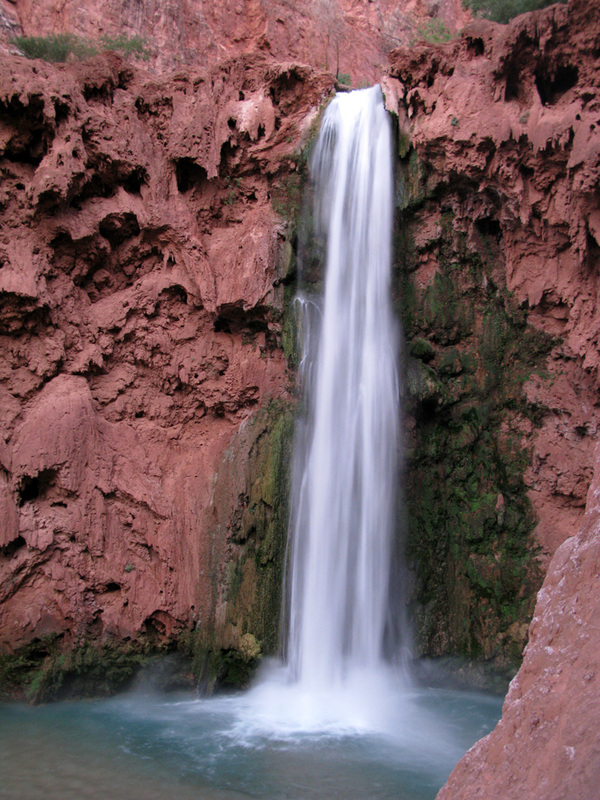 The descent to Mooney falls (photo by Jesse). 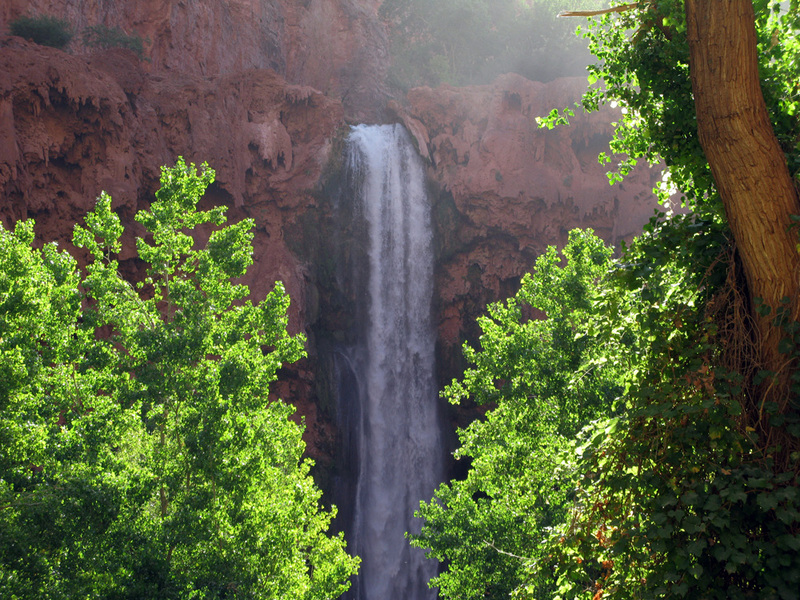 Mooney falls - saved the best for last. We hiked back towards the campground where we discovered an isolated spot: our very own island with Havasu creek flowing on both sides. We felt protected from roaming critters and had the ideal white noise of rushing water to lull us to sleep. Well we were right about one thing: we did not “hear” any creature come by and steal our bag of food. Though that may not be hard to believe, since the culprit so deftly extracted a bag of mangos from the double knotted plastic food bag, decided it wasn’t to his liking, left the bag of mangos on the ground, and took off with the entire food bag (which contained salami, cheese, and this delicious power trail mix). We were a bit peeved in the morning, but mostly astonished at his/her craftsmanship. No trace or evidence nearby except for a few teeth marks on the mango bag. We were entirely wrong on another account. The island didn’t protect us from small game or critters. Before going to bed, we found 2 scorpions roaming our site. One about to enter Pat’s shoe as the very same time he was advising me to check my shoes. Although Steve killed both with a strike of his K-bar knife, it did not satiate our fear. 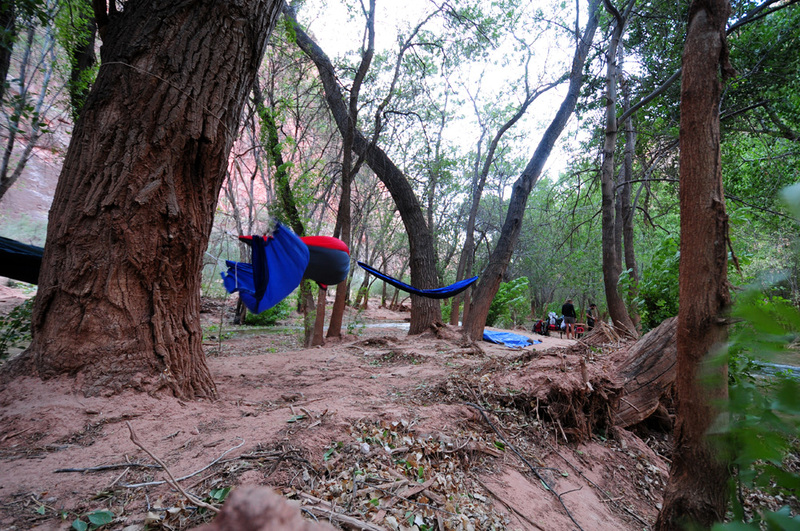 We slept more or less safe and sound in our hammocks away from the ground. 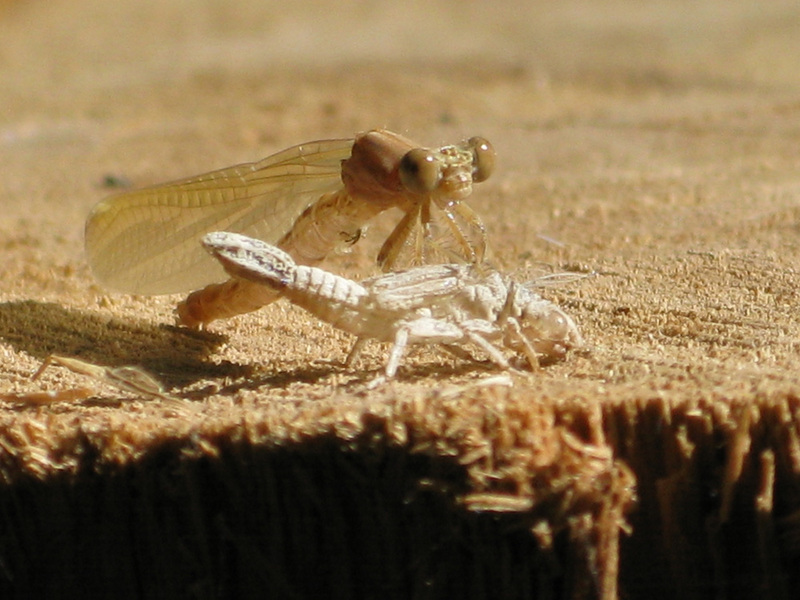 Though later we learned (Jesse did a little research) that those were bark scorpions, small light brown scorpions common in the southwest and the most venomous in North America! Although fatalities are rare, severe pain is almost certain. We were happy not to have known this until afterwards. No pics of the scorpions, but here's another little critter. Our own scorpion infested island (photo by Jesse). 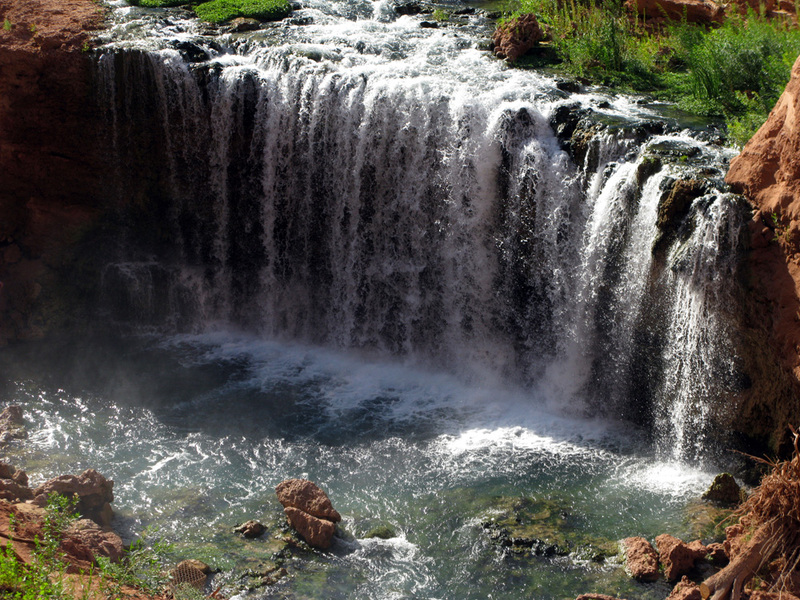 The next morning we made a modest breakfast of oatmeal (it was all that we had left), visited Mooney falls once again for a morning dip, and headed back up to the Supai village where we lunched on greasy burgers at the one and only café. We also enviously watched hikers boarding a helicopter to be lifted out of the canyon at the price of $85 a person. 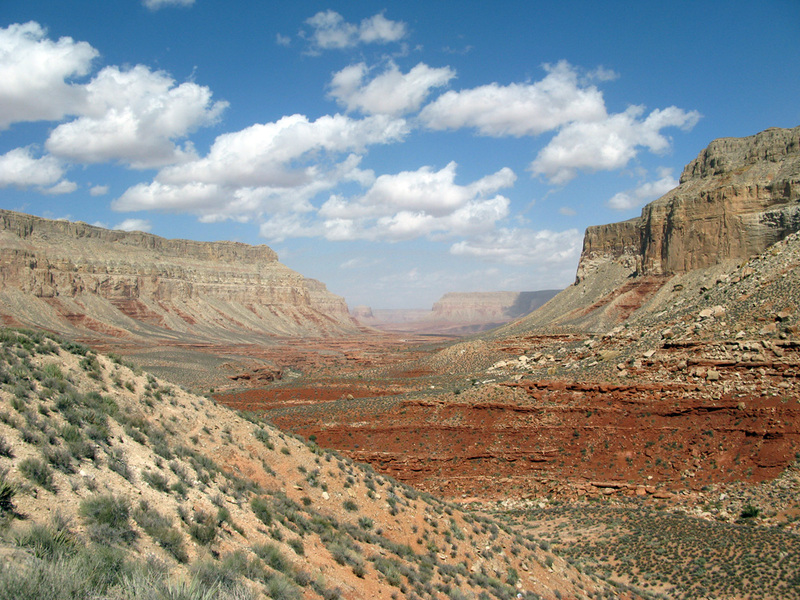 There is only one other way out of the canyon, and that’s to hike the 8 miles back up to the rim. In a sense, we felt proud of our upcoming achievement and pitied them for their lack of resolve. 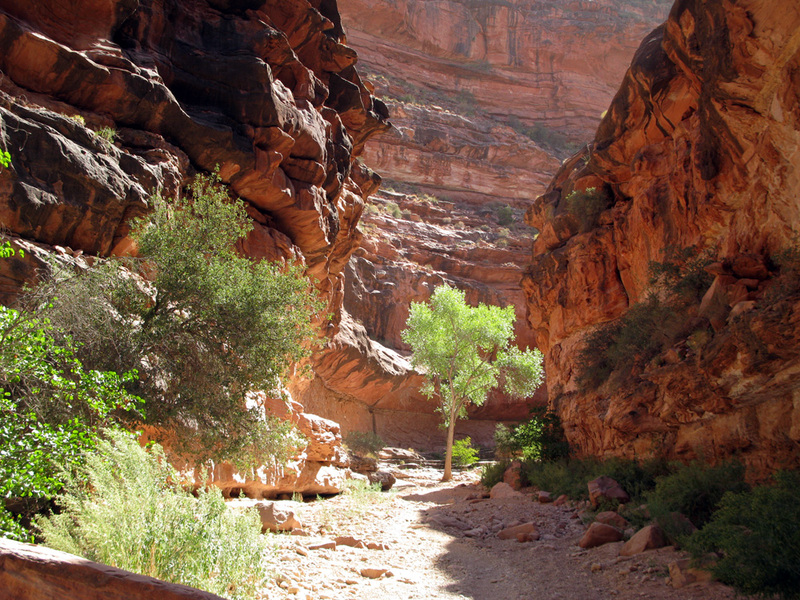 So we walked away with poise and retraced our steps through the canyon. We were quite militant this time around and completed the whole thing in 3 hours (I’m not counting the hour or so we stopped in the village). Not much chit-chatting or picture taking, just one foot in front of the other in a single file march through the hot desert. We only stopped for short water breaks and at the sight of a meandering fox. To our relief and delight, at the end of the 1.5 steep ascent back to the top, we were greeted by a group of cheerful Dutchmen, applauding our final steps up to the rim’s summit with enthusiasm and awe as we made it back from the “downstairs”. We felt quite proud. They shared with us their sad tale of a failed attempt, as they took the helicopter back up. Mooney in the morning light. Caro found a nice spot to relax. Pat and Jesse getting pummeled at the base of Mooney. Steve getting a close up of the guys. Back up from "the downstairs." We celebrated with a buffet dinner in Seligman, where we barely made it into the restaurant with sore legs, knees and feet. The boys tolerated my bouts of giggles, brought on by absolute exhaustion. After the drive home, we settled in at Steve’s place back in Prescott over another round of Gentleman Jack. There we were serenaded by Bob Dylan’s brilliant lyricism and Steve’s immaculate performance of the The Last of the Mohicans and Legends of the Falls theme songs on violin. A perfect finale to an adventure-packed journey through Northern Arizona. Thanks Jesse and Steve!! 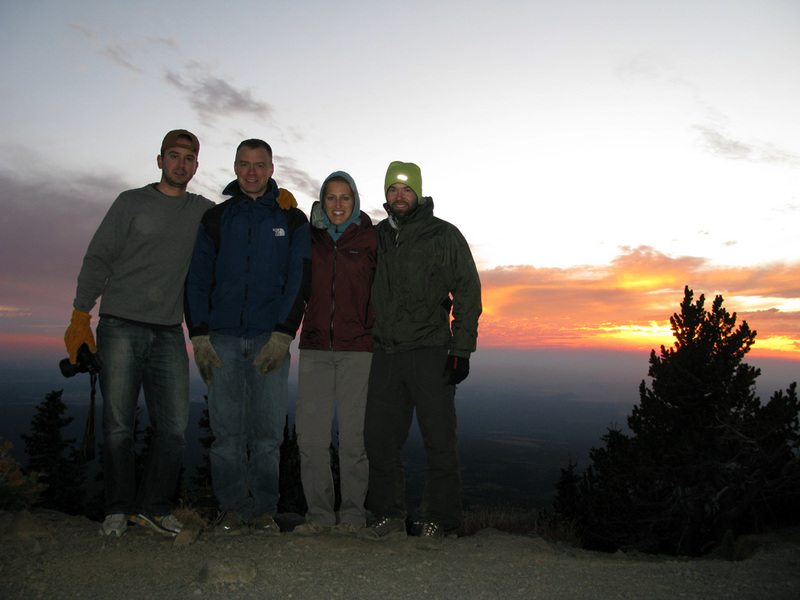 For a more poetic rendition of what happened during these five extraordinary days touring the diverse and breathtaking Arizonian terrain, I encourage you to consult the personal blogs of the brothers VonFange, Jesse and Steve. We can’t match their expressive and moving narratives, since each singularly describes our journey from the highest and lowest points in Arizona with passion and contemplation – a true reflection of the beauty we witnessed. Awe, you two are the best. Great entry! I’m sipping on a Gentlemen Jack in memory of our adventures! Godspeed. I just got caught up on your October posts and it was great to hear about the recent adventures. What an awesome several weeks! Sounds like Moab was exactly as I envisioned it…hopefully we will get there sometime in the next few years. Be safe and stay away from the poisonous critters! What an adventure! I read every addition to your blog, so well illustrated with your beautiful pictures. All I can say: “Keep on trekking!” We are going to Arizona during the season holiday and I will read again about your adventure there. We will be in Sedona, we rented a house that will be our base for daily excursions. I will not push it the way you do, but we intend to fill our days. Hugs and kisses from Ottawa. Hey you two, remind me to tell you about our own trials and tribulations of Havasu and Mooney Falls! Very comical. Still having fun I see! Yey! We made the blog 🙂 …..cheers to many other extraordinary adventures ahead! !